Working to grow is just so hard and sometimes may not seem worth the effort. There was, however, someone who new it was worth it and that we were worth it! He is just waiting for us to take the step forward to work towards a better life- one He can show us how to live and become. The cheerful girl with bouncy golden curls was almost five. Waiting with her mother at the checkout stand, she saw them; a circle of glistening white pearls in a pink foil box. "Oh please, Mommy, can I have them? Oh, Mommy, please!" Quickly the mother checked the back of the little foil box and then looked back into the pleading blue eyes of her little girl’s upturned face. "A dollar ninety-five. That’s almost $2.00. If you really want them, I’ll think of some extra chores for you an in no time you can save enough money to buy them for yourself. Your birthday’s only a week away and you might get another crisp dollar bill from Grandma." As soon as Jenny got home, she emptied her penny bank and counted out 17 pennies. After dinner, she did more than her share of chores and she went to the neighbor and asked Mrs. McJames if she could pick dandelions for ten cents. On her birthday, Grandma did give her another new dollar bill and at last she had enough money to buy the necklace. Jenny loved her pearls. They made her feel dressed up and grown up. She wore them everywhere -Sunday school, kindergarten, even to bed. The only time she took them off was when she went swimming or had a bubble bath. Mother said if they got wet, they might turn her neck green. Jenny had a very loving daddy and every night when she was ready for bed, he would stop whatever he was doing and come upstairs to read her a story. One night when he finished the story, he asked Jenny, "Do you love me?" "Oh, yes, Daddy. You know that I love you." "Then give me your pearls." "Oh, Daddy, not my pearls. But you can have Princess - the white horse from my collection. The one with the pink tail. Remember, Daddy? The one you gave me. She’s my favorite." "That’s okay, Honey. Daddy love you. Good night." And he brushed her cheek with a kiss. About a week later, after the story time, Jenny’s daddy asked again, "Do you love me?" "Daddy, you know I love you." "Then give me your pearls." "Oh, Daddy, not my pearls. But you can have my baby doll. The brand new one I got for my birthday. She is so beautiful and you can have the yellow blanket that matches her sleeper." "That’s okay. Sleep well. God bless you, little one. Daddy love you." And as always, he brushed her cheek with a gentle kiss. A few nights later, when her daddy came in, Jenny was sitting on her bed with her legs crossed Indian-style. As he came close, He noticed her chin was trembling and one silent tear rolled down her cheek. "What is it, Jenny? What’s the matter?" Jenny didn’t say anything but lifted her little hand up to her daddy. And when she opened it, there was her little pearl necklace. With a little quiver, she finally said, "Here, Daddy. It’s for you." 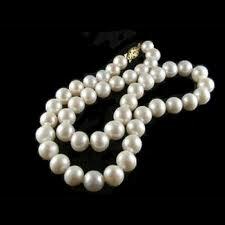 With tears gathering in his own eyes, Jenny’s kind daddy reached out with one hand to take the dime-store necklace, and with the other hand he reached into his pocket and pulled out a blue velvet case with a strand of genuine pearls and gave them to Jenny. He had had them all the time. He was just waiting for her to give up the dime-store stuff so he could give her genuine treasure. So like our Heavenly Father.